One year ago, I participated in my second Angels for Orphans Fitness Challenge and I thoroughly enjoyed being a part of a great fundraising team. The aim was to raise funds for Bali Kids whilst getting fitter. Building on the previous year experience and a renewed desire to do good, I summoned all my courage and threw myself into the task at hand. Right! This time I would ask everyone I knew to sponsor me, not only just my close friends and family. The first person, a colleague, who sponsored me on the fundraising page set the bar at HKD$250 so everyone else - well, from work anyway - matched it! Nobody wanted to seem stingy I suppose. Oh no wait, I do work with fabulous people! Still, I was stunned at the final award ceremony to find out that I was named the top fundraiser! So many people showed their generosity at their own level for a great cause. No big amount was part of this, just loads of fantastically big-hearted people. And guess what? There were prizes other than the huge feeling of self-worth and satisfaction; a basket full of organic goodies from Everything Organic and two return tickets to Bali! Now in over 13 years in Hong Kong, I have never been to Bali. The first thing that came to mind was, "Great I can go pay a visit to Bali Kids!". As we normally stay in Hong Kong for Christmas and I was lucky to break off a week early, we set off to the closest place listed on the Bali Kids website; Ubud, which is a 40 minutes ride from the airport. All last minute to add to the excitement. I was therefore quite relieved that the director from Bali Kids answered positively to my visit request sent with less notice than needed. 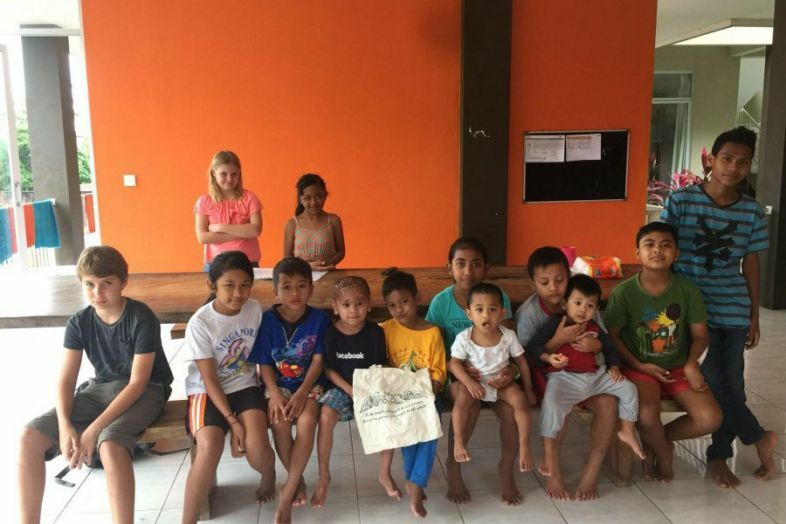 We (my kids came too) had packed items from the Bali Kids wish list so off we went! The rain was torrential that day so it was apparently not the best time to go since the volcano was also threatening to erupt. But the weather and the volcano did not deter us, we were determined to meet the children behind the smiles and see how our fundraising helped them. The director from Bali Kids met us, explained their core values and mission statement before taking us around to tour the orphanage and meet the kids. One thing is clear. They do their upmost to leave the kids with their families whenever possible. So, as it was holiday time, many of the kids were away with family members. Still it was great to meet the supportive Bali Kids staff and the kids that were there, seemed so happy to be together sharing a moment with us on a rainy afternoon. What a memorable trip! What’s next? Looking forward to the next fundraising activity!